New York City’s Central Park is a favourite gathering place of both tourists and locals alike. The park’s 3.41 square kilometres boasts ponds, sculptures, archways, meadows, and gardens, all framed by NYC’s emblematic skyscrapers. Featured in countless movie scenes, with so much to see and do, it’s no wonder that Central Park is one of New York’s most iconic locations. As a nature lover, I always try to seek out a city’s more natural side, so it’s no surprise that Central Park was my favourite place we visited during our five days in New York City. We dedicated an entire day to Central Park and I still went back during my second trip to New York City. Both times I visited Central Park it was late-January, so the trees were bare and the park was lacking colour (the light wasn’t good for photography either). Yet even in winter, Central Park was still a beautiful place to go for a stroll. We decided to do a self-guided walking tour of Central Park so we could explore at our own pace and spend time at the attractions that interested us most. Now, I knew Central Park was big, but huge is a much better word to describe it. I mistakenly thought we could walk the entire length of the park and still have energy to go skating at Wollman Rink afterwards. Wrong! By the time we got to the north end of the reservoir our feet were aching. So, we turned around our walking tour of Central Park at the 97th street transverse, leaving the park’s most northern section unexplored. Even though we didn’t complete our walk as intended, we still got to enjoy many attractions in Central Park. Perhaps most interesting, was seeing how the atmosphere changed the further north we got. South of the Great Lawn feels very touristic, but north of that we felt like we had entered the “backyard” of New York City’s locals. This may have been our first visit to Central Park, but it made such an impression I could happily return each time I’m in New York City! There are so many attractions in Central Park, with several distinct areas to explore, that we had no trouble spending a whole day here. You could visit over and over again and still discover something new. For our walking tour of Central Park, we started with the attractions at the southeast side near 5th Avenue, then worked our way north, meandering between the east side and centre, before returning along the southwest side. As you will soon see, no matter what your interests are- be it nature, art, history, or fitness- there’s something for everyone in Central Park. Here’s a look at what we felt were the best places to see in Central Park during a self-guided walking tour. To help you plan your visit, I made a map of the main sites in Central Park we saw during our walking tour. As soon as you enter the park from 5th or 6th Avenue, the Pond is there to welcome you with its serene atmosphere. You can walk along the water’s edge and watch ducks swimming, pass by the secluded Hallett Nature Sanctuary where small animals and birds thrive, then cross over the stone arch of Gapstow Bridge. Gapstow Bridge offers wonderful views of New York City’s skyscrapers and the Plaza Hotel, making it a popular photo location in Central Park. A stop at Wollman Rink is a must during a winter visit to Central Park. New York’s skyline creates a romantic backdrop (especially at night) for ice skaters participating in one of the city’s most beloved winter traditions. I still haven’t skated in Central Park myself, but it’s definitely on my list for next time! Considering how many dogs I saw being walked in Central Park, it’s only fitting that there be a statue of one too. Balto was a sled dog in Alaska who led his team in delivering medicine to treat a diphtheria epidemic in 1925. Balto and 20 sled dog teams raced through extreme winter conditions from Anchorage to Nome, arriving 20 hours later with the medicine that helped end the epidemic. In recognition of the brave efforts of Balto, this bronze statue was created and dedicated in December 1925. The Mall is Central Park’s widest, and perhaps most picturesque, pedestrian pathway thanks to the double row of American elms arching over the walkway. I’d love to walk along here in the fall, under a canopy of autumn colours. The southern end of the Mall is known as the Literary Walk because of the statues of four prominent writers- Scottish poet Robert Burns, Scottish novelist Sir Walter Scott, American poet Fitz-Greene Halleck, and English poet and playwright William Shakespeare. At the end of the Mall you’ll arrive at Bethesda Terrace, one of Central Park’s main architectural attractions. There are some interesting details sculpted into the terrace, but the primary showpiece is the arcade’s Minton tile ceiling featuring almost 16,000 encaustic tiles on 49 panels. Another highlight of the terrace is Bethesda Fountain. The fountain is topped by the Angel of the Waters statue commemorating when New York City first got fresh water in 1842. Unfortunately, a downside of visiting Central Park in the winter is not getting to see water flowing in this beautiful fountain. This memorial to children’s author Hans Christian Andersen was a gift funded by the Danish-American Women’s Association on behalf of Danish-American schoolchildren. The statue commemorates the 150th anniversary of Andersen’s birth and features the author holding an open book while a curious duck sits at his feet. I assume the bird is supposed to represent Andersen’s character The Ugly Duckling, but it looked pretty cute to me! This ornamental pond is popular from April to October when people come to sail model boats. There wasn’t much going on here in the winter; it was just a pretty place to relax before continuing our walk through Central Park. Seeing the Alice in Wonderland sculpture in Central Park took me back to the carefree days of childhood, when imagination was all the entertainment I needed. The climbable statue depicts Alice sitting on a mushroom while White Rabbit, the Cheshire cat, and Mad Hatter look on. Across from the Metropolitan Museum of Art is the Obelisk, the oldest outdoor monument in New York City. Commissioned in 1450 BC by an Egyptian pharaoh, the obelisk was traded to America in 1880 by the Egyptian Khedive in exchange for money to modernize his country. The obelisk was erected in Central Park in January 1881 and has a time capsule buried beneath it. Of all the interesting sites in Central Park, this one surprised me most since I was not expecting to see an Egyptian obelisk here. The reservoir was an area of the park we really liked because there were fewer tourists here. The running track that circles the perimeter proved to be popular with the locals, but we underestimated just how big it was to walk around. Our feet got so sore! From the east side of the reservoir we enjoyed pleasing views of the neighbouring architecture and had fun guessing how much it would cost to live in a building overlooking Central Park. Belvedere Castle was one of our favourite places in Central Park because we loved the views from its top terrace. We could look out across the Great Lawn towards the reservoir, see the Ramble to the south, and enjoy 360-degree views of the surrounding cityscape. Built in 1869, Belvedere Castle house a visitor center, gift shop, and instruments for measuring the weather. Even though I didn’t go inside the Swedish Cottage, I did appreciate its rustic architecture. The cottage was built in Sweden in 1875 then shipped to Philadelphia the following year for the U.S. Centennial Exposition. Afterwards, the cottage was moved to Central Park where it served many purposes before becoming headquarters for the Parks Department’s Marionette Theatre. Across from the Swedish Cottage is Shakespeare Garden, a landscape featuring flowers and plants mentioned in Shakespeare’s literary works. Admittedly, it’s not much to look at in the winter, but we still enjoyed strolling along and reading the plaques engraved with Shakespeare quotes. As we passed through the Ramble, it quickly became my favourite of the scenic walks in Central Park. This rocky, wooded area was the perfect place to escape the buzz of the city and connect with nature. Exploring the meandering paths of the Ramble, we discovered a small stream, stone arch, rustic bridges, plenty of birds, and great views of the Lake. It was hard to believe we were still in one of the biggest cities in the world! For me, the best part of our walk through the Ramble was seeing more squirrels than people. They’re so cute! Gracefully crossing over the Lake, Bow Bridge links the Ramble’s woodlands to Cherry Hill. Completed in 1862, Bow Bridge is decorated with eight large urns filled with plants, helping make the Lake one of the most romantic landscapes in Central Park. If we ever come back to Central Park in the summer, I would love to rent a boat and go rowing on the Lake. I think that would be the perfect way to enjoy Central Park! As fans of the Beatles and John Lennon, Strawberry Fields was one of our top places to see in Central Park. Named after one of Lennon’s favourite songs, Strawberry Fields was dedicated on October 9th, 1985- what would have been his 45th birthday. The centerpiece of this contemplative location is the Imagine mosaic, a gift from the Italian city of Naples. In the heart of the memorial of is the word Imagine, title of the Lennon song encouraging unity and peace. Across the street from the Imagine mosaic is the Dakota apartment building where John Lennon lived, and sadly, was murdered. Even though Strawberry Fields is a designated quiet zone, each time I’ve visited there was a musician playing Beatles/John Lennon songs at the Imagine mosaic. It was a nice touch and we loved listening to the music and soaking up the atmosphere. Our self-guided walking tour of Central Park ended near Umpire Rock, in the southwest section on the park. Umpire Rock was one of the most commanding examples of the exposed bedrock we saw throughout the park. Climbing atop the rock’s folds and veins, we enjoyed one final view of the skyscrapers towering over Central Park. As great parks do, Central Park invites you to wander. We walked and walked until our feet couldn’t take any more, but even then I still wanted to experience more of Central Park. What I appreciated most about Central Park was the variety of scenery and activities. What surprised me the most was the history contained within its borders. I wasn’t expecting to see so many old pieces of architecture, monuments to historic and cultural figures, and ancient geological formations. Even though it was impossible to do everything we wanted, we felt like our walking tour showed us the best places to see in Central Park for first-time visitors. In spite of the light being really strange during my visits, I still took a lot of photos of Central Park. Here are a few more to inspire your own self-guided walking tour of Central Park! Central Park was established in 1857 and was the first major landscaped public park in the United States. Central Park is the fifth largest park in New York City and most visited urban park in the U.S. with over 42 million annual visitors. There are 58 miles (93.3 km) of paths in Central Park. The perimeter of Central Park is 6.1 miles (9.8 km). The park has its own NYC Police Department precinct. The Mall is the only intentional straight pathway inside the park boundary. The statue of Fitz-Greene Halleck was the first one of an American to be placed in Central Park. Location: Central Park is located in Manhattan between 59 St (Central Park South) and 110 St (Central Park North), and 5th Ave and 8th Ave (Central Park West). Getting There: The easiest way to get to Central Park is by subway as there are multiple lines servicing all sides of the park. There is no parking in Central Park. Hours: Central Park is open 365 days a years from 6:00 am- 1:00 am. Visitor Centers: There are five visitor centers in Central Park open from 9:00 am-7:30 pm in the summer and 10:00 am- 5:00 pm the rest of the year. Maps: You can pick up a free map at a visitor center or the information kiosks located in the park. There’s also good signage with maps posted throughout the park. How to Long to Spend in Central Park: I recommend spending at least half a day in Central Park, but a whole day is best to fully enjoy it. I did this exact walking tour in 3 hours (but that was rushing it), and another time took a whole day to do it. Places to Eat: For quick snacks, there are food carts scattered around the park, plus some permanent cafes and concession stands with outdoor seating. There are three full service restaurants in Central Park- The Loeb Boathouse Restaurant, Tavern on the Green, and Le Pain Quotidien. 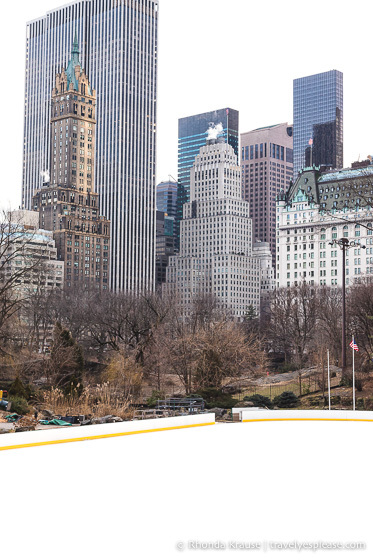 Ice Skating: There are two rinks for skating in Central Park- Wollman Rink in the south and Lasker Rink in the north. There is an admission fee and rentals are available. Boats: Rowboats are available for rent at the Loeb Boathouse on the Lake from April- October. Biking in Central Park: Cycling is not allowed on pedestrian paths (unless it is marked as shared), so you will have to stick to the park Drives. You can only travel counter-clockwise on the Drives that circle the park. Consult this Central Park Bike Map for more information. Bike Rentals: You can rent bicycles in Central Park in the southeast corner at the Grand Army Plaza entrance (near 5th Ave and 59 St), or in the southwest corner at Merchants’ Gate Plaza (next to Columbus Circle at Central Park South and Central Park West). If you’d prefer to reserve in advance, here is a trusted site where you can book a bike rental. Tours: The Central Park Conservancy offers a variety of tours. The fee helps support the care of Central Park. For your convenience, here is a list of HOTELS IN NEW YORK CITY. Please consider booking your New York City accommodations through the included link. It costs nothing extra and helps support this website. Thank you! The New York CityPASS- What Is It and Should You Buy It?